The Sultanate of Zanzibar (Swahili: Usultani wa Zanzibar, Arabic: سلطنة زنجبار‎, translit. Sulṭanat Zanjībār), also known as the Zanzibar Sultanate, comprised the territories over which the Sultan of Zanzibar was the sovereign. Those territories varied over time, and at one point included all of what is now Kenya as well as the Zanzibar Archipelago of the Swahili Coast. Later, the kingdom's realm included only a ten mile wide coastal strip of Kenya and Zanzibar. Under an agreement concluded on 8 October 1963, the Sultan relinquished sovereignty over his remaining territory in Kenya. 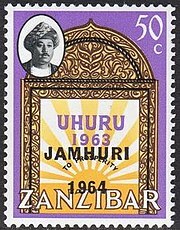 On 12 January 1964, Sultan Jamshid bin Abdullah was deposed and lost sovereignty over the last of his dominions, Zanzibar. In 1698, Zanzibar became part of the overseas holdings of Oman after Saif bin Sultan, the Imam of Oman, defeated the Portuguese in Mombasa, in what is now Kenya. In 1832 or 1840, Omani ruler Said bin Sultan moved his court from Muscat to Stone Town on the island of Unguja (that is, Zanzibar Island). He established a ruling Arab elite and encouraged the development of clove plantations, using the island's slave labour. Zanzibar's commerce fell increasingly into the hands of traders from the Indian subcontinent, whom Said encouraged to settle on the island. After his death in 1856, two of his sons, Majid bin Said and Thuwaini bin Said, struggled over the succession, so Zanzibar and Oman were divided into two separate realms. Thuwaini became the Sultan of Muscat and Oman while Majid became the first Sultan of Zanzibar, but obliged to pay an annual tribute to the Omani court in Muscat. During his 14-year reign as Sultan, Majid consolidated his power around the local slave trade. His successor, Barghash bin Said, helped abolish the slave trade in Zanzibar and largely developed the country's infrastructure. The third Sultan, Khalifa bin Said, also furthered the country's progress toward abolishing slavery. According to the 16th-century explorer Leo Africanus, the native inhabitants of the Zanzibar (Zanguebar) sultanate were for the most part pagans with curly hair and a black complexion. However, the denizens of the northernmost Zanzibar kingdom of Malindi were Muslims of an almost white complexion, with some pagan black inhabitants among them. Until 1884, the Sultans of Zanzibar controlled a substantial portion of the Swahili Coast, known as Zanj, and trading routes extending further into the continent, as far as Kindu on the Congo River. That year, however, the Society for German Colonization forced local chiefs on the mainland to agree to German protection, prompting Sultan Bargash bin Said to protest. Coinciding with the Berlin Conference and the Scramble for Africa, further German interest in the area was soon shown in 1885 by the arrival of the newly created German East Africa Company, which had a mission to colonize the area. In 1886, the British and Germans secretly met and discussed their aims of expansion in the African Great Lakes, with spheres of influence already agreed upon the year before, with the British to take what would become the East Africa Protectorate (now Kenya) and the Germans to take present-day Tanzania. Both powers leased coastal territory from Zanzibar and established trading stations and outposts. Over the next few years, all of the mainland possessions of Zanzibar came to be administered by European imperial powers, beginning in 1888 when the Imperial British East Africa Company took over administration of Mombasa. The same year the German East Africa Company acquired formal direct rule over the coastal area previously submitted to German protection. This resulted in a native uprising, the Abushiri Revolt, which was crushed by a joint Anglo-German naval operation which heralded the end of Zanzibar's influence on the mainland. 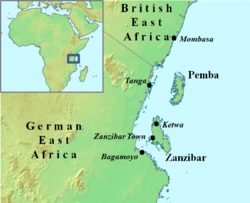 With the signing of the Heligoland-Zanzibar Treaty between the United Kingdom and the German Empire in 1890, Zanzibar itself became a British protectorate. In August 1896, following the death of Sultan Hamad bin Thuwaini, Britain and Zanzibar fought a 38-minute war, the shortest in recorded history. A struggle for succession took place as the Sultan's cousin Khalid bin Barghash seized power. The British instead wanted Hamoud bin Mohammed to become Sultan, believing that he would be much easier to work with. The British gave Khalid an hour to vacate the Sultan's palace in Stone Town. Khalid failed to do so, and instead assembled an army of 2,800 men to fight the British. The British launched an attack on the palace and other locations around the city after which Khalid retreated and later went into exile. Hamoud was then peacefully installed as Sultan. That "Zanzibar" for these purposes included the ten-mile coastal strip of Kenya that would later become the Protectorate of Kenya was a matter recorded in the parliamentary debates at the time. In 1886, the British government encouraged William Mackinnon, who already had an agreement with the Sultan and whose shipping company traded extensively in the African Great Lakes, to establish British influence in the region. He formed a British East Africa Association which led to the Imperial British East Africa Company being chartered in 1888 and given the original grant to administer the territory. It administered about 150 miles (240 km) of coastline stretching from the River Jubba via Mombasa to German East Africa which were leased from the Sultan. The British "sphere of influence", agreed at the Berlin Conference of 1885, extended up the coast and inland across the future Kenya and after 1890 included Uganda as well. 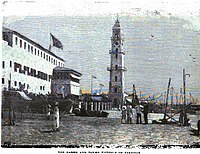 Mombasa was the administrative centre at this time. On 23 July 1920, the inland areas of the East Africa Protectorate were annexed as British dominions by Order in Council. That part of the former Protectorate was thereby constituted as the Colony of Kenya and from that time, the Sultan of Zanzibar ceased to be sovereign over that territory. The remaining ten-mile wide coastal strip (with the exception of Witu) remained a Protectorate under an agreement with the Sultan of Zanzibar. That coastal strip, remaining under the sovereignty of the Sultan of Zanzibar, was constituted as the Protectorate of Kenya in 1920. The Protectorate of Kenya was governed as part of the Colony of Kenya by virtue of an agreement between the United Kingdom and the Sultan dated 14 December 1895.:762 In summary, the "Colony of Kenya" referred to the interior lands. The "Protectorate of Kenya" was a ten-mile coastal strip together with certain islands which remained under the sovereignty of the Sultan of Zanzibar until the independence of Kenya. On 10 December 1963, the Protectorate that had existed over Zanzibar since 1890 was terminated by the United Kingdom. The United Kingdom did not grant Zanzibar independence, as such, because the UK had never had sovereignty over Zanzibar. Rather, by the Zanzibar Act 1963 of the United Kingdom, the UK ended the Protectorate and made provision for full-self government in Zanzibar as an independent country within the Commonwealth. Upon the Protectorate being abolished, Zanzibar became a constitutional monarchy under the Sultan. Sultan Jamshid bin Abdullah was overthrown a month later during the Zanzibar Revolution. Jamshid fled into exile, and the Sultanate was replaced by the People's Republic of Zanzibar and Pemba. In April 1964, this short-lived communist republic was united with Tanganyika to form the United Republic of Tanganyika and Zanzibar, which became known as Tanzania six months later. By 1964, the country was a constitutional monarchy ruled by Sultan Jamshid bin Abdullah. Zanzibar had a population of around 230,000 natives, some of whom claimed Persian ancestry and were known locally as Shirazis. It also contained significant minorities in the 50,000 Arabs and 20,000 South Asians who were prominent in business and trade. The various ethnic groups were becoming mixed and the distinctions between them had blurred; according to one historian, an important reason for the general support for Sultan Jamshid was his family's ethnic diversity. However, the island's Arab inhabitants, as the major landowners, were generally wealthier than the natives; the major political parties were organised largely along ethnic lines, with Arabs dominating the Zanzibar Nationalist Party (ZNP) and natives the Afro-Shirazi Party (ASP). 1 2 Gascoigne, Bamber (2001). "History of Zanzibar". HistoryWorld. Retrieved 2012-05-23. ↑ "Coins of Zanzibar". Numista. Retrieved 2012-05-23. ↑ "Background Note: Oman". U.S Department of State - Diplomacy in Action. ↑ Africanus, Leo (1526). The History and Description of Africa. Hakluyt Society. pp. 51–54. Retrieved 11 July 2017. 1 2 3 "British East Africa". www.heliograph.com. ↑ "BRITISH EAST AFRICA. (Hansard, 13 June 1895)". hansard.millbanksystems.com. ↑ "The Harem and Tower Harbour of Zanzibar". Chronicles of the London Missionary Society. 1890. Retrieved 2 November 2015. 1 2 3 4 5 6 7 8 9 Roberts-Wray, Sir Kenneth (1966). Commonwealth and Colonial Law. F.A. Praeger. ↑ Kenya (Annexation) Order in Council, 1920, S.R.O. 1902 No. 661, S.R.O. & S.I. Rev. 246. ↑ Kenya Protectorate Order in Council, 1920, S.R.O. 1920 No. 2343 & S.I. Rev. VIII, 258, State Pp., Vol. 87, p.968. ↑ "Kenya Gazette". 7 September 1921 – via Google Books. ↑ HC Deb 22 November 1963 vol 684 cc1329-400 wherein the UK Under-Secretary of State for Commonwealth Relations and for the Colonies stated" "An agreement was then signed on the 8th October, 1963, providing that on the date when Kenya became independent the territories composing the Kenya Coastal Strip would become part of Kenya proper." Parsons, Timothy (2003), The 1964 Army Mutinies and the Making of Modern East Africa, Greenwood Publishing Group, ISBN 0-325-07068-7 . Shillington, Kevin (2005), Encyclopedia of African History, CRC Press, ISBN 1-57958-245-1 . Speller, Ian (2007), "An African Cuba? Britain and the Zanzibar Revolution, 1964. ", Journal of Imperial and Commonwealth History, 35 (2): 1–35 . "Zanzibar, a sultanate and British protectorate of East Africa" . Encyclopædia Britannica (11th ed.). 1911.